.Thanks to many generous donations this year, Dare to Care for Children was able to give out everything to create Thanksgiving Dinner to 15 families this year. Dare to Care, would like to thank everyone who participated in the event this year. Many thanks. 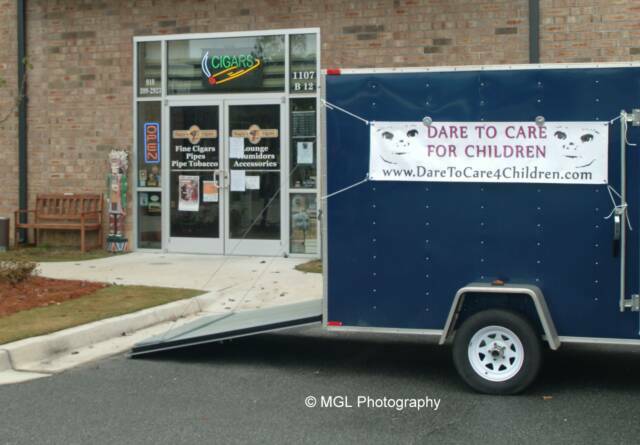 For the second year, the Dare to Care for Children organization donated Thanksgiving Dinners to families in the area. Last year, 10 dinners were donated. This year, 15 dinners were donated. The dinners included a 12-14 lb turkey, cake mix, w/icing, a box of tea, string beans, rice gravy, yams, corn, cranberry sauce, 5 lbs of potatoes and 1 dozen dinner rolls. The food was donated by: Allmetal Roofing, Piggly Wiggly (Leland), Food Lion (Leland), Bugsy's Cigars, Dollar Tree, Black River Mini Mart of Currie, Family Dollar in Atkinson, Harris Teeter (Leland), and Walmart (Leland). The banner for the event was donated by Murray Art & Frame (Leland). The distribution point this year was at Bugsy's Cigars in Leland.